Thompson Squared on the PGA Tour: The season has finally begun! Well I find myself in an airport again, so I guess that means it’s time to write another blog. And since my computer is running out of battery power, it will have to be a quick one. In fact, all my electronics seem to always be dying right before a trip, as I have a habit of not plugging them in the night before. I guess I figure technology is so smart now, they should be able to figure out how to charge themselves without my intervention. I bet they do for the Dos Equis man...his electronics don’t always need to be charged, but when they do, they do it themselves; or maybe they recharge him. Since I haven’t updated yall in a while, you probably want to know what we’ve been up to since the season started. Sorry for not keeping everyone updated in Hawaii...we were staying with friends who didn’t have wireless internet, so I never really had an opportunity to post anything. Hawaii was of course beautiful and the weather perfect. It was so much fun doing my daily devotional in Kapiolani Park, or on the beach surrounded by God’s beautiful masterpiece! We had a wonderful first tournament of the year and Michael was really able to see the things he needed to work on. He actually played extremely well and came away with a lot of positives for the week. We had a week off after Hawaii which I spent at home cleaning, unpacking, reorganizing and decorating the house. Actually I only spent about 3 days working because I became totally obsessed with the show Downton Abbey. I just couldn’t stop watching! (I blame you Lesley!) When I finally did get to work, it was so awesome going through boxes and wedding gifts that have been in storage the past 2 years and it was neat to find old memorabilia from my past in youth soccer, high school, at Tulane and Emory, etc. And it was fun going through all of Michael’s old school stuff and seeing all his half filled notebooks (did he just get tired of taking notes halfway through the semester?) from his classes at Tulane and Alabama...let’s just say it was very enlightening. As many of you know, my notebooks were always filled to the brim, and then highlighted, and then typed up and highlighted again. Totally not an over-achiever though...Plus I totally feel like an adult now cause I unpacked our china and have some of it on display. Does the fact that I also have my stuffed animals from when I was little on display mean I don’t qualify for adult status anymore? Michael spent the week in Phoenix practicing and working out. And a good thing too cause we had a massive snow storm here...well massive for Birmingham. I estimate we got about 2 inches. Having grown up in Northern Virginia where we got snow every year in the winter, I really miss the snow living in the south. The most exciting part about the snow is that the kids in our neighborhood decided to build a snowman in my front yard. There I was on the phone with my mom, when I walk by the front door and see about 15 kids in my front yard building a 5 1/2 foot tall snowman. I’m not sure if they thought no one was home, but I absolutely LOVE the fact that we live in a neighborhood where kids feel comfortable doing something like this without getting in trouble. I took some fruit and vegetables out to them to use to decorate with and they thought that was the coolest thing. Operation meet the neighbors continues at a slow and steady pace. They all knew who Michael is, but I figured I’d try to show them that we are normal people just like them, no better or worse than anyone else. I told them if Michael were home, he would be out there building a snowman with them, and they thought that was awesome. I’ve never owned a house so I don’t know if this is normal neighborhood kid behavior, but it made me happy beyond measure that we have such wonderful friendly neighbors! We spent this past week in San Diego at the Farmer’s Insurance Open. It has been a pretty crazy week, playing two normal rounds of golf Thursday and Friday with Michael going -4 for his last 6 holes to make the cut on Friday, then waking up at 4 am on Saturday to spend 10 hours sitting in the clubhouse with the rest of the PGA Tour waiting out the fog, then waking up at 4 am again and playing 32 holes on Sunday in the freezing cold (yes 53 is cold when you failed to pack the appropriate outerwear for such weather), before finally finishing the last 4 holes of Michael’s 4th round Monday afternoon. I guess there is more than one way to play a PGA event. Michael again learned a lot about what he needs to work on and is really looking forward to this week where the PGA Tour travels to his home state of Arizona. And so we are finally in Phoenix for the Waste Management Phoenix Open, where we are so excited to spend the week with our friends Kyle and Lesley (even though Lesley is the one responsible for introducing my new addiction). I will try and do better about posting during the tournament, though I won’t be in an airport so I’m not sure how I will manage...guess i’ll have to improvise. This should be an exciting week as we have so many friends and family coming out (both my family and Michael’s are from Arizona). Please pray for us as we continue to try and figure this crazy life out and as we try to develop our own personal routine out here when every week brings a different schedule and new challenges. Lastly, just want to remind everyone of one of God’s promises. It is one of my life verses and comes in Jeremiah 29:11 “For I know the plans I have for you,” declares the Lord, “plans to prosper you and not to harm you, plans to give you hope and a future.” This is what gives me peace and joy and courage to face each day knowing that I don’t have to be in control or worry about anything. God has already planned how this day and the rest of my future will go and no matter what happens, I know it is for my benefit because he loves and cares for me. God’s plans are always better than our plans and we must accept the path he calls us to walk on. Sometimes, God’s plan calls for us to go through difficult situations and hardships. We may not understand what he is doing, but we can be sure what he is doing will make us stronger when it’s over. Hebrews 12 7-11 is one of my new favorite sections of the Bible. It basically says, “Endure hardship as discipline; God is treating you as his children. For what children are not disciplined by their father?...but God disciplines us for our good, in order that we may share in his holiness. No discipline seems pleasant at the time, but painful. Later on, however, it produces a harvest of righteousness and peace for those who have been trained by it.” God disciplines us at times, and it is NOT fun, but if we endure it and learn from it, we come out of it so much better than before. And when I remember that God has a plan for my life to prosper me, those times of discipline become much easier to bear. Proverbs 3: 5 always helps during times of trial, “Trust in the Lord with all your heart, and lean not on your own understanding.” I may not understand what God is doing at times, but I will still trust Him because he promises it will be for my good. I hope you all remember to trust God, even when it is hard to do so. 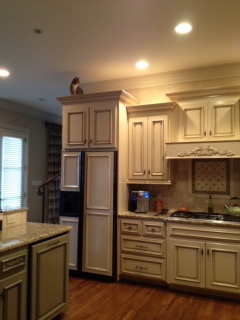 And a shoutout to our cat Bubbles who finally accomplished her life goal and made it to the top of our kitchen cabinets, from which she can oversee the appropriate running of her entire household!